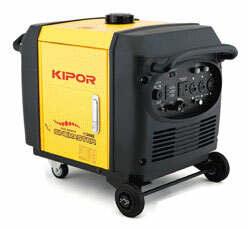 The Kipor portable "inverter-generator" is a lightweight and quiet alternative to most other generators on the market. Equipped with an econo-throttle to vary the engine speed according to the load, these sets provide super-clean, super-quiet power, are computer friendly and provide up to a 10 hour run time on a single tank of gas!. With a 4-cycle gasoline powered engine (no messy gas/oil mixing) providing a full 3000 watts, these little powerhouses are great for emergency power at home or on-the-job, portable power on-the-go for boating, camping, or for usage at cabins and remote sites. With the built in wheel set, it can easily be moved about by one person. The electric start system makes starting in any weather condition, fast & simple. The onboard control panel provides standard 120VAC receptacles and a 25 amp full power twist lock receptacle. Rugged, rust proof chassis design. Full two year warranty. hurricanes and winter snow & ice storms! KEEP YOUR FAMILY SAFE & WARM DURING THE STORM! Power to run the fridge, heat, lights and TV, all at once! Don't wait for the NEXT big storm to hit... Order Yours today!